Stephen F. Hayes is a senior writer at The Weekly Standard and author of two New York Times bestsellers:Cheney: The Untold Story of America’s Most Powerful and Controversial Vice President and The Connection: How al Qaeda’s Collaboration with Saddam Hussein Has Endangered America. He is a regular Fox All Stars panelist on Special Report with Bret Baier. Before joining The Weekly Standard, Hayes was a senior writer for National Journal’s Hotline. 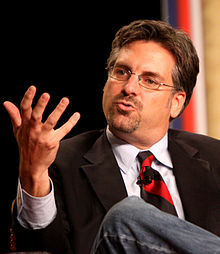 He also served for six years as Director of the Institute on Political Journalism at Georgetown University. His work has appeared in the New York Post, the Washington Times, Salon, National Review, and Reason. He has been a commentator on CNN, The McLaughlin Group, the Fox News Channel, MSNBC, CNBC, and C-SPAN. A graduate of Columbia University Graduate School of Journalism and DePauw University, Hayes was born and raised in Wauwatosa, Wisconsin.